Planning on sailing to explore the great state of Alaska? Good call! An Alaska cruise is a phenomenal way to soak in the natural splendor. Scenery is knock-your-socks-off gorgeous. From blue hued glaciers to bald eagles to breaching humpback whales, prepare to be in awe of everything with these 7 essential Alaska cruise tips. Snow capped mountains and glimmering waters with glaciers are calling visitors to Alaska. MelodiousTraveling Mom and her family highly recommend cruising as the means of getting around the Inside Passage. Photo by Sherry Boswell. Alaska may be the 49th state, but it’s tops for most inspirational and scenic destinations to visit. And cruising is a popular means of navigating this massive and diverse place. Melodious TravelingMom learned a few tips in planning her family’s adventures. 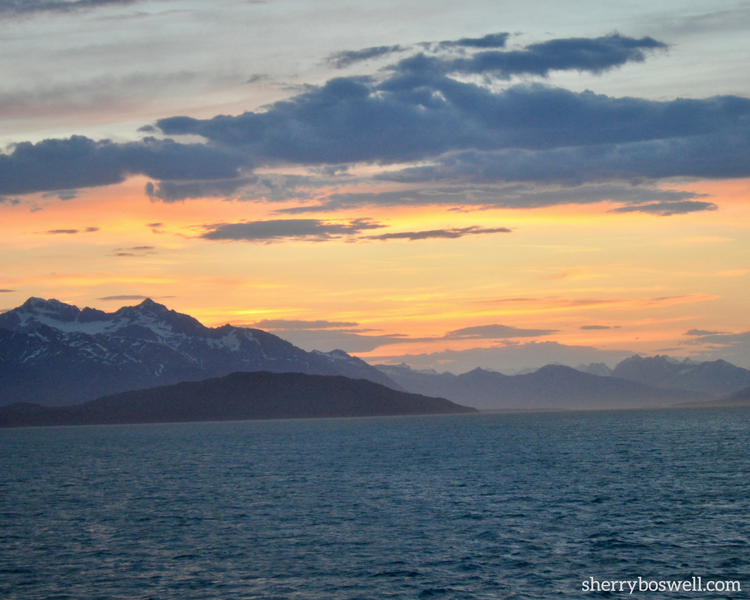 Here are her Top 7 list of essential tips when planning an Alaskan Disney cruise. It’s easy to overpack for an Alaskan cruise. Weather is extremely unpredictable. The key to packing for Alaska is summed up by one word: LAYERS. Like Shrek describing ogres to his pal Donkey as an onion with layers, so too is the need for lots of clothing layers. Then if it gets warm as it did often while we were in Alaska the second week of June, layers can be shed. And naturally, boots, bulky jackets, and all the accompanying rain gear take up a lot of luggage space. Yes, to that extent, packing for changes in weather and the range of 30-80 degrees can be tricky. TravelingMom Tip: But here’s the secret to save money on checked bag fees: do laundry onboard. Washing and drying one load of laundry cost only a few dollars. Seals are bountiful in waters leading to the Dawes Glacier. Photo by Sherry Boswell, Melodious TravelingMom. Camera. While we typically rely on our iPhones for photos due to simplicity, this trip demands better cameras and lenses. You want to have the ability to zoom to see the seals lazing on the ice, bald eagles swooping in for fish, and the humpback whales cresting and breaching. Sounds like a wonderful excuse to upgrade cameras if that is a possibility. Go Pro. We also brought our GoPro and wondered if we would get to use it. We mounted it on our verandah and did a time lapse video and also used it while kayaking. In the end, bringing the Go Pro was a good call. Binoculars. Our Duh moment was that we forgot binoculars and the cheapskate in me couldn’t bring myself to pay $100 for a pair on the ship. So don’t be like us: pack your binoculars! Rain gear. it’s going to rain some in Alaska. That much is assured. Lucky for us, it only did for 15 minutes in Juneau, but count on needing some rain gear all the same. Especially when cities like Ketchikan receive 80-200 inches of rain a year! Find more cruise packing tips at TravelingMom. 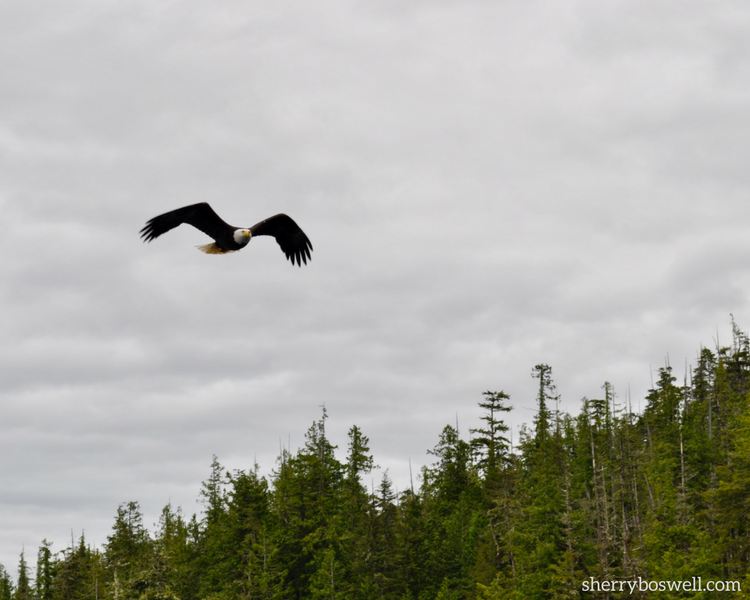 Bald eagles outside Ketchikan are bountiful during our Bering Sea Fisherman’s Tour. Photo by Sherry Boswell, Melodious TravelingMom. Southeast Alaska is 80% forest service land; 10% of which is in Glacier Bay National Park. Alaska gets 80-200 inches of rain a year. Whoa! That said, it only misted on us for about 15 minutes the entire trip. Hooray! We expected to see porpoises, dolphins, harbor seals, sea lions, bald eagles, mountain goats, bears, wolves, and whales. After hearing this, I couldn’t wait to get out there and start looking! Tip: When whale watching, look for the exhale first. It’s the “tell” that a whale may be surfacing soon. We wouldn’t have known any of that either if we had missed the Alaska Naturalist Presentations. Most cruise ships offer naturalists onboard to provide heads up information on all the scenery and wildlife you will encounter. It’s a definite must see! Our naturalist, Doug Jones, who incidentally sounds a lot like Donald Sutherland, was incredibly informative with an impressive Power Point presentation. These seminars were PACKED, and frankly they made me even more excited about the impending glacier visit and the subsequent days in our ports (Skagway, Juneau, and Ketchikan).Our Disney cruise had 3 presentations as well as our glacier day over the intercom system for a small window of time (due to laws governing when that can be done so as not to interfere with nature). Alaska is what I would call a splurge destination. To do all the excursions can be expensive, but think of it this way: Will you be going back? Or is this a once in a lifetime trip? Maybe the cruise itself is splurge enough. Whatever the answer, it’s wise to figure that out before the cruise. Not to say that the Port Adventures desk can’t be accommodating, but some of the more popular adventures book up well in advance. One if by land, two if by kayak! 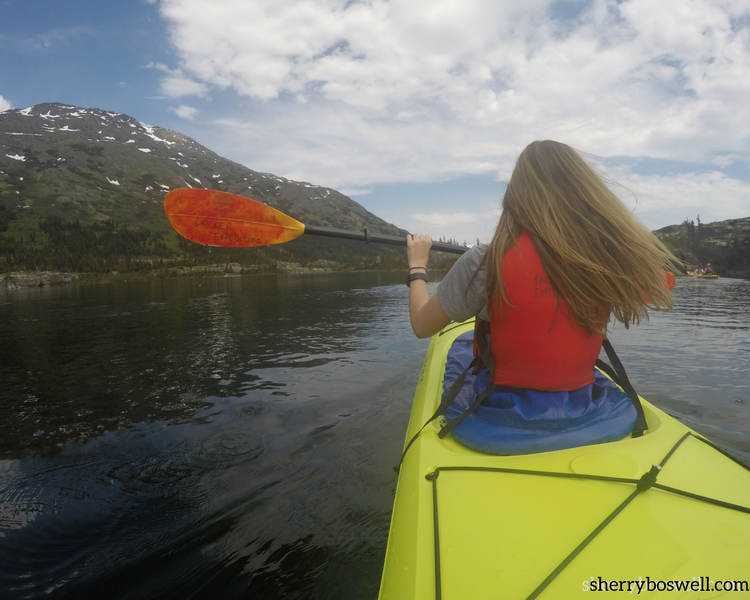 We really love exploring a place by kayak. Gives a totally different perspective. Photo by Melodious TravelingMom Sherry Boswell. First and foremost, this is NOT the cruise to stay on the ship in any port. Get out and explore. Even if you don’t have the budget for excursions, walk around the ports of call. Don’t have to spend lots of money to have a good time. Bonus: it stays light late. Sunsets happen around 10pm. As it gets into the summer, this area of Alaska known as the Inside Passage gets 18 hours of daylight. More daylight time means more time to explore. 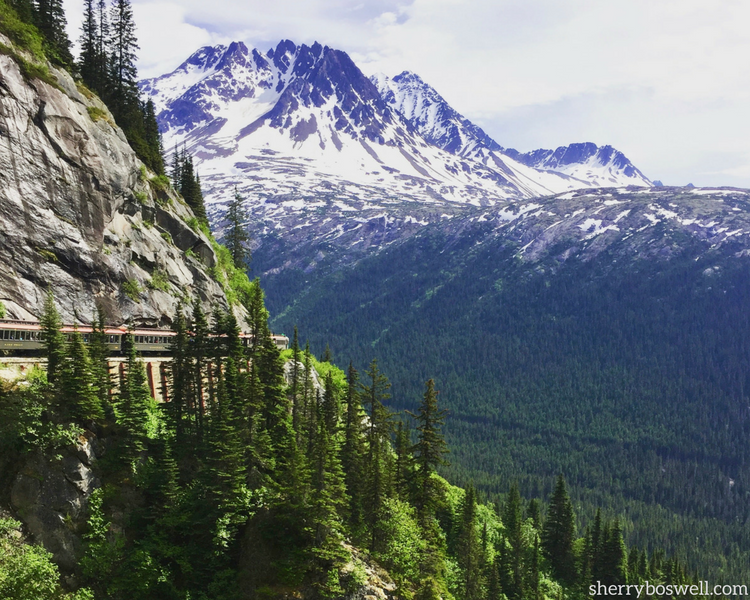 We had perfect clear weather for cruising down the mountains from Canada to Skagway onboard the White Pass & Yukon Route Railroad. Photo by Melodious TtravelingMom Sherry Boswell. The final rule: with Alaska, be prepared for anything (particularly weather). Our helicopter/dogsledding excursion in Juneau got canceled due to low cloud cover. This was THE excursion we had talked the most about leading up to the cruise, especially our 12-year-old Alaska and husky-obsessed son. While we were all bummed, we quickly rallied and took a bus to Mendenhall Glacier. While not the excursion we had planned, we made lemonade out of lemons and wound up having a fun day nevertheless. Although we missed out on dogsledding, Toddler TravelingMom Britni says it’s totally worth the money. For more advice on choosing excursions, see what Cruise Critic has to say. The bottom line: Find excursions that appeal the most. Save up for the ones that are once-in-a-lifetime worthy. And know that the cruise will still be amazing even if excursions are out of the question. Stretch out and take a nap on a lounge chair. Go watch a movie. We had plenty of options, including recent releases Pirates of the Caribbean: Dead Men Tell No Tales, Guardians of the Galaxy Volume 2, and Beauty and the Beast. Treat yourself to a spa treatment. Better yet, make it for two! My teen daughter and I chose the mother-daughter massage. When I found out that I would be sitting in the room with her if she had a solo treatment (because she’s under 18), I figured why not just join her? A balcony is THE way to see Alaska. As if the previous points on wildlife and glaciers didn’t prove this fact, there are yet other reasons to claim a stateroom with a verandah. Wondrous breakfast views and cocktail hours. Serenity looks like a morning beverage in the fresh Alaskan air as you float past snow-capped mountains and cloud-speckled skies. Privacy. A balcony provides easy access to the outdoors at various times of day in an uncrowded, cozy spot. We did an impromptu sunset photo shoot with our teen and grabbed some fabulous shots that we wouldn’t have been able to without the verandah. Having a balcony also means more chances to snag sunset shots like these. Photo by Sherry Boswell, Melodious TravelingMom. 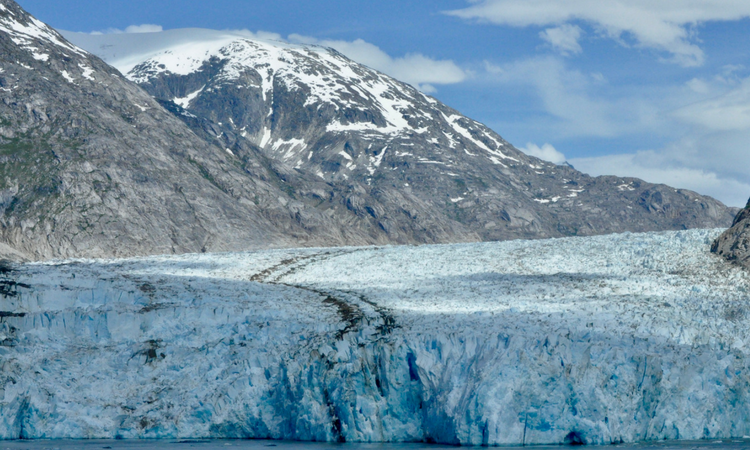 Alaskan cruises are synonymous with glaciers. But I had no idea really what to expect. Let me tell you: glaciers are stunning. The icy blue color is intense, and glaciers are massive. 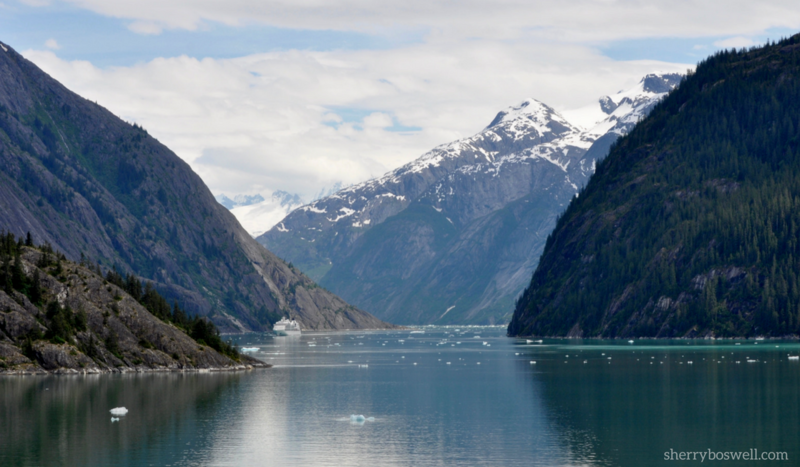 Although many cruises anticipate seeing the Tracy Arm Fjord, that area was too choked with ice to access. So our cruise went to Endicott Arm Fjord and the Dawes Glacier. As the naturalist said, “it’s a win-win.” Either one is spectacular. Getting up close and personal with the Dawes Glacier at Endicott Arm fjord. We had hours to soak in the majesty of such a creation. Photo by Melodious TravelingMom Sherry Boswell. Even more phenomenal is when chunks of ice break off a glacier, called “calving.” Ice breaks because the forward motion of a glacier makes the end unstable. Lucky for the seals that this happens because the resulting chunks of ice are icebergs. Glaciers are awe-inspiring, jaw-dropping sights to behold. In an era of technology and fast-paced everything, being able to sit back and enjoy the glacier was one of the most serene moments I’ve had in years. Relish that opportunity and simply sit down and soak it all in. This goes without saying: parents and kids NEED to have some separate time from each other. The kids will thank you later. There is plenty of family time, especially when cruising to Alaska. My teen and tween loved their respective clubs available on the Disney Wonder and made friends quickly. Having already dined at Palo on the Disney Dream, it was a definite “must do” for this vacation. It costs extra, but for the food caliber, it’s totally worth it. Mmm-delizioso! 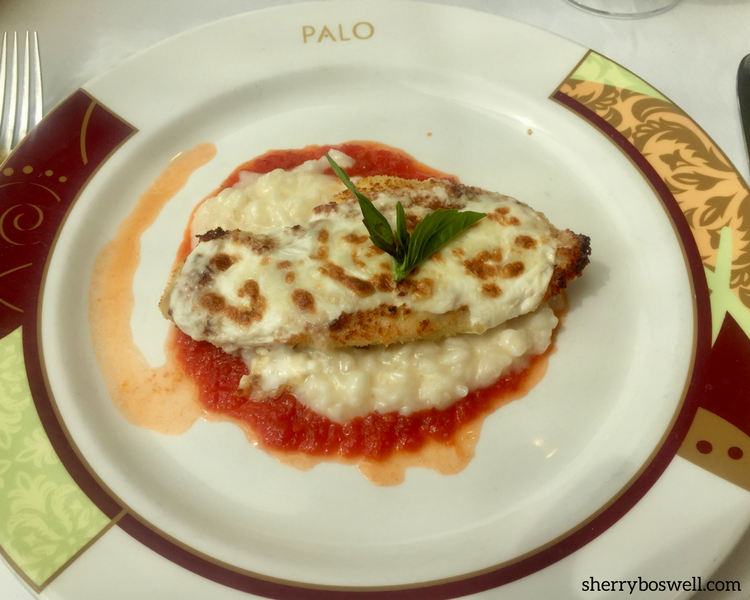 Chicken parmesan over risotto is a signature dish for a reason at Palo. Photo by Sherry Boswell, Melodious TravelingMom. Palo on the Disney Wonder lived up to its lofty reputation and wowed us. Our server Susana was exceptional! I love her comment that our smaller spoon for the brunch means smaller calories. And she assured me the chocolate souffle had no calories! Care to devour more about Palo? 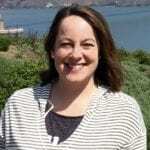 The check out Wayfinding Traveling Mom Jennifer’s post on Palo. What’s a cruise without an assortment of drink seminars? These guided tastings are opportunities to sample beverages and learn about their origins. The Disney Wonder offers classes on mixology, wine, champagne, beer, tequilas and margaritas, whisky, martinis, cognac, amari, rum, and chocolate and liquor tastings. We chose the Tequila and Margarita tasting, and it did not disappoint. 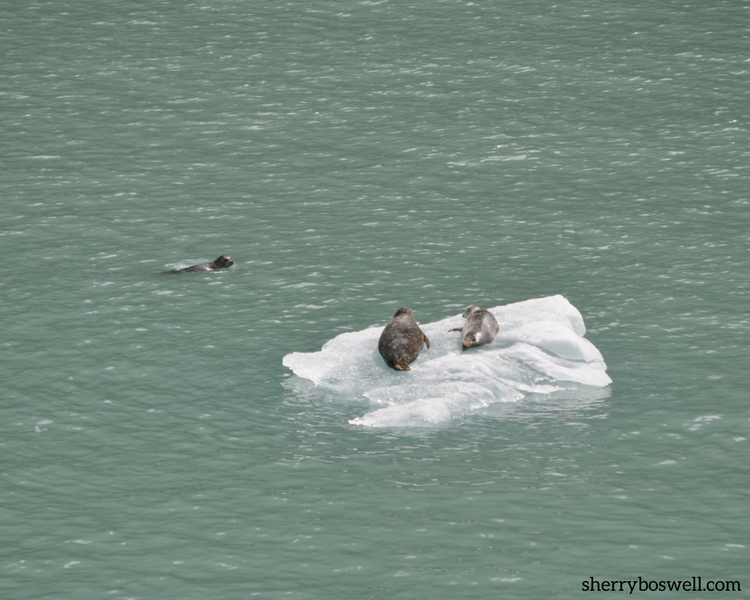 There’s something surreal about enjoying a beverage seminar and spying seals atop ice as you approach a glacier. At $20 per person (on average), the seminars are reasonably priced. Tequila plus glaciers equals one fun beverage seminar! Photo by Melodious TravelingMom Sherry Boswell. Drinks at the Cadillac Lounge became my favorite dinnertime aperitif or dessert. My idea of the perfect way to relax and unwind. Special shoutout to our pianist, Tim Moss. He plays a stunning range of songs, even taking requests. The “Pink Cadillac” became my absolute favorite: Ciroc Coconut, Watermelon Liquor, and Moët Ice and served with a macaron. 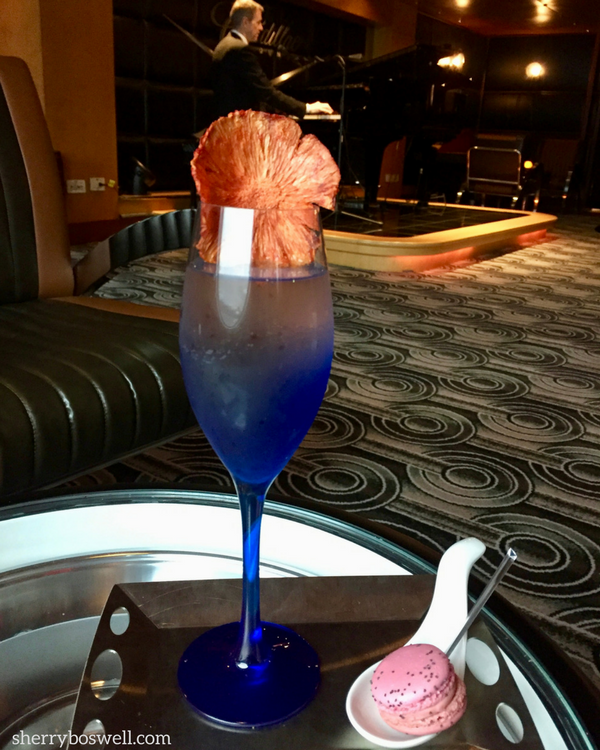 Nothing like a wonderful piano bar and a delicious beverage to get totally relaxed. Hey, I’m not called Melodious TravelingMom for nothing! Photo by Sherry Boswell. Get Help Booking Your Alaskan Disney Cruise! Booking a cruise is a complicated process. Our partners at Destinations in Florida are experts in all things Disney. Contact them for customized help planning your Disney cruise vacation. We have an affiliate relationship with Destinations in Florida. If you book through the service, you will help support TravelingMom in addition to getting the help you need to book a magical Disney cruise vacation. 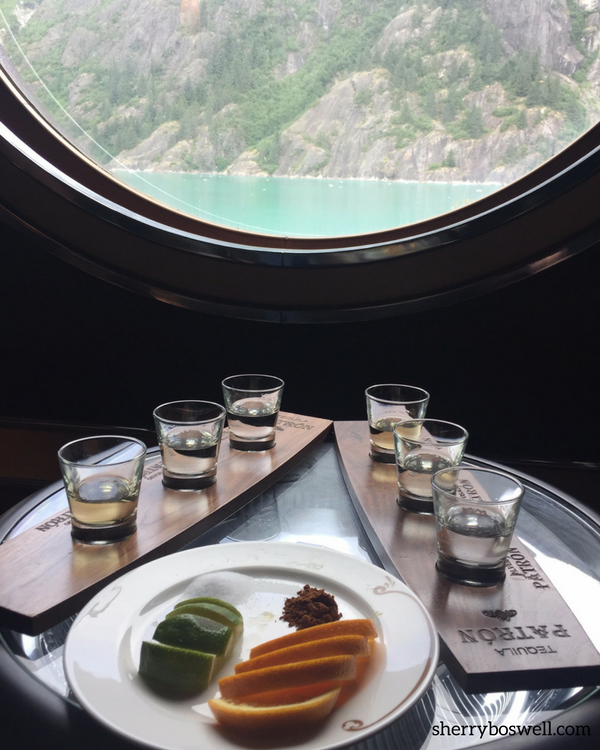 If a large cruise ship doesn’t float your boat, check out Luxe TravelingMoms Sherry & Dana’s experience with UnCruise. 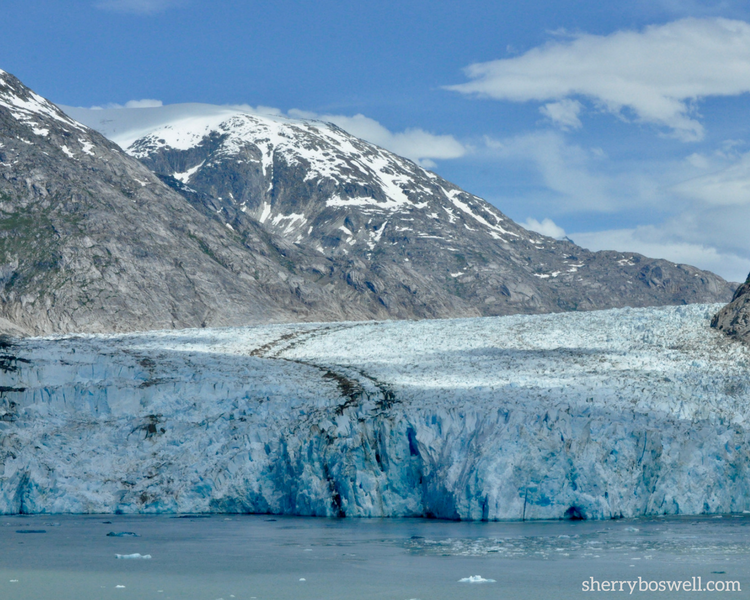 And Serendipity TravelingMom Dee shares her Alaska cruising tips with a multigenerational family. Cruise in Your First Trimester? Yes You Can!